"Pierced Heart" Zippo Windproof Lighter - Brushed Chrome | BUDK.com - Knives & Swords At The Lowest Prices! Sometimes deep affection and desire can feel like a dagger in the chest. Has lost love left your heart wounded and scarred - dripping with blood and tormented with pain? Fall in love again, and reignite that missing spark with this awesome new lighter from Zippo! Perfect for goths or anyone who appreciates dark, brooding art, the front of this distinctive brushed chrome lighter shows the sinister hand of a robed skeleton clutching the handle of a bat-winged fantasy dagger. The blade is plunged deep into an anatomically correct human heart, blood vessels hemorrhaging and blood dripping from the dagger's piercing point. Printed via Zippo's cutting edge "color image imprint method," the illustration features vibrant colors and is loaded with countless fine details and smart accents. 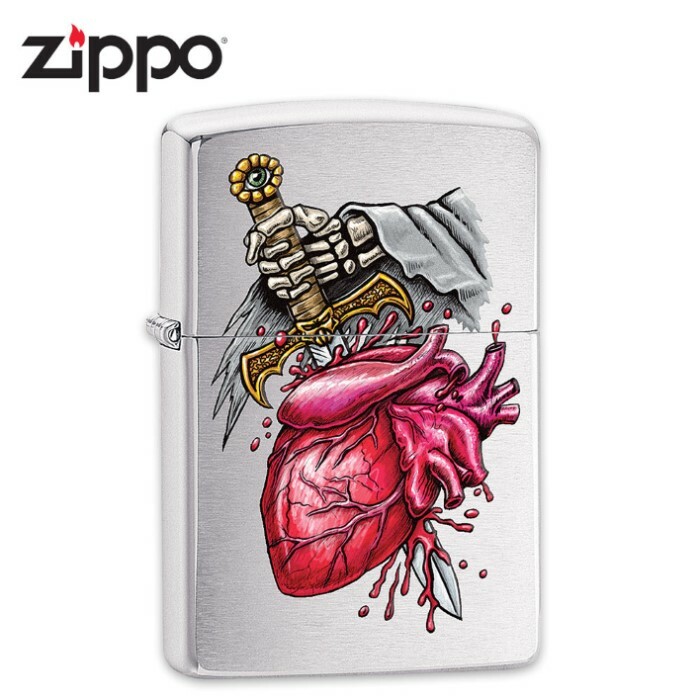 Like all Zippos, the "pierced heart" lighter is windproof and refillable for a lifetime of dependable use. It's proudly made in the USA and boasts all-metal construction and Zippo's rock solid lifetime guarantee.